Although home to a myriad of treasures, Flores has often gone unnoticed. Yet it’s an island which offers adventures at every turn of our Volcanoes & Dragons Trails. Adventure Riders Indonesia offers scheduled 10, 5 and 1 day off-road adventure motorcycle tours around Flores and will lead you through some of the best that Indonesia has on offer. Ride through volcanic mountains passes, tropical jungle and spider-web rice fields and down black-sand beaches. 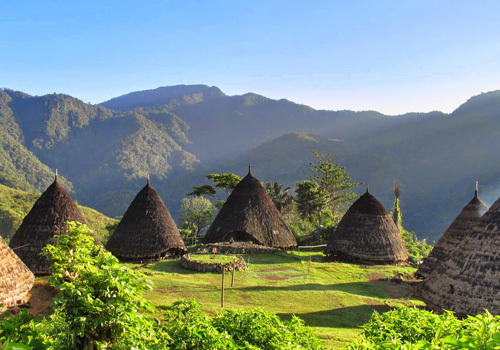 Stay in traditional Manggarai and Ngada villages that have hardly changed in centuries. Climb Volcano Kelimutu with its mystically coloured crater lakes, Beach BBQ and camping , hot springs and a visit to Komodo National Park. Possibilities are endless and the riding and terrain are some of the best you’ll find anywhere. If it’s action packed dirt bike adventure riding you seek then you have come to the right place. Flores has it all!!! We will pick you up at Labuan Bajo airport around 1 pm and transfer to a nearby hotel. After lunch we will have time for a briefing outlining safety, tour program and a introduction to the Kawasaki KLX 250. Late Afternoon we will make a sunset ride around the hills in Labuan Bajo area and fine tune the bikes if needed. Following evening dinner and drinks at hotel. Early morning breakfast and quick briefing before we‘ll make our way along the South west coastline with amazing views of the Komodo National Park. Lunch break before making our way to Wae Rebo base camp. Afternoon 1.5 hr trek through lush rain forest to the Wae Rebo Traditional village. Once we arrive in the village we will meet with the head elder of the village who will initiate us into the Wae Rebo family. Dinner and stay the night in Traditional house. Early morning, we have breakfast in Wae Rebo village and trek back to basecamp to meet the bikes then back on the road again. 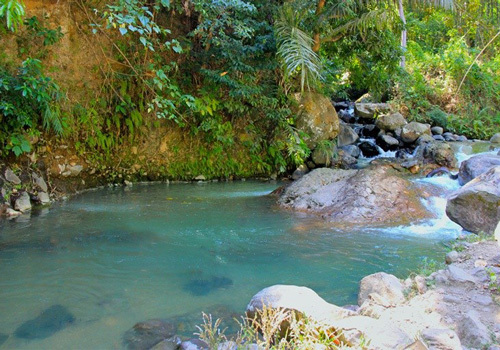 We travel east along Flores beautiful south west coastline, crossing rivers and local villages along the way. Afternoon we arrive at Vitalis Beach camp where we will be hosted by a friendly local family, BBQ and camping. Early morning, we have a spectacular ride across the coastal savanna and up to the hill tribe areas in the Ngada regions. Resting on the flanks of Mt Inerie is the traditional villages of the Ngada people. It should be noted, that the village of Bena and Gurusina, offers one of the last remaining traces of the Ngada peoples remarkable megalith culture. Afternoon we head to one of the local hot springs for a splash and a cold beer. Accommodation and dinner with a local Gurusina family staying in a traditional house. After an early morning breakfast with the Gurusina village family we’re back on the bikes again riding up into spectacular mountain passes flanking Mt Inerie. Lunch break in the Ngera village and some real off-road action winding through the hills and down to the ocean. Afternoon coastal ride to Ende where we will have time to wash and service the motorcycles. Accommodation 3-star hotel and dinner at a local seafood restaurant. After a quick breakfast at our hotel we will ride though Ende’s surrounding mountains. Some great off-road action and challenging sections to be found here that are sure to test your riding skills. Afternoon ride to the beautiful Koka Beach for afternoon swim, Beach BBQ and camping. We have some awesome off-road riding today as we make our way up to the rooftop of Flores through rugged mountain passes where wild horses roam, stopping in remote villages and tackling steep rocky trails. After lunch we will make our way up towards the famous Mt Kelimutu. Accommodation at the Kelimutu eco lodge. Following yummy dinner and live music at local reggae bar and restaurant. First light we have an impressive ride up to Mt Kelimutu, with its 3 colored lakes is probably one of the most amazing phenomenon of Flores. Quick breakfast then it’s time for the infamous Jungle attack! Teamwork is essential through this thick and unforgiving jungle. Fallen logs and branches make for a very interesting days riding. After lunch we ride to the north coastal town of Mbay. Accommodation and dinner at Mbay guest house. Another day of action pack jungle trails and off the beaten track riding. Quick lunch in Riung and we make our way along the rugged coastline to a lovely little secluded beach where we set up camp and enjoy a cold beer and a seafood BBQ while watching the sunset. Our final day of riding takes us from the remote northern shores of Flores along small winding mountain roads to the Komodo gateway of Labuan Bajo. Accommodation in Hotel and final dinner and drinks. Breakfast and transfers to Labuan Bajo airport. Optional Komodo Day Trip on requests: snorkelling, Scuba diving and a visit to see the famous Komodo Dragons.